Protesters gathered in Capitol on Monday in support of abortion restrictions. 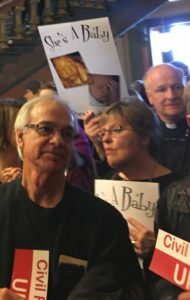 A bill that would forbid Iowa doctors from performing abortions after a pregnancy’s 20th week has cleared an initial hurdle in the state senate. However, it’s unclear if the legislation will be altered or if GOP lawmakers will advance other abortion restrictions instead. Amanda Acton of Waukee pleaded with senators this morning to table legislation that would prohibit abortions after a pregnancy has reached week number 20. “You will not save lives with this legislation. Only one percent of abortions occur after 20 weeks and most women who are deciding to have abortion after 20 weeks are, like me, deciding to prevent the assured suffering of a much-wanted child out of compassion and love,” Acton said. Acton’s pregnancy was at week 21 when her doctor told Acton and her husband the baby had a rare genetic condition and did not have lungs. Tears ran down Acton’s cheeks as she spoke. The bill would not penalize women who seek or get an abortion after the 20th week of a pregnancy, but it would charge doctors who perform the abortions with a felony. Joan Thompson of the Iowa Catholic Conference called current state law “ultra permissive” when it comes to late-term abortions. Senators listen to testimony on bill. “After facing years of obstacles…we have a path to begin to end the assault on the lives and dignity of women and children and protect the fundamental right to life,” she said. Thompson urged senators to ban all abortions after 20 weeks of pregnancy. The state senate has already passed a bill that would “defund” Planned Parenthood. Another bill that would declare that life begins at conception is pending in a senate committee. No other state has a similar law. Supporters say if that bill becomes law in Iowa, it could trigger a court case to challenge the “Roe v Wade” decision that legalized abortion.